Tim continues his election coverage this week by travelling to Markham, Ontario. He’s invited young up and comer Abdul Malik to join him this week. Abdul is just 30 years old and that’s why Tim wanted to sit down with him. The pair don’t always see eye to eye politically. But they didn’t stop them from having a lively debate. The hot topic in Ontario these days is Doug Ford’s decision to chop the size of Toronto city council in half. Tim loves this idea. He thinks that government is too slow and unresponsive. It sometime takes years to get a decision that should only take months. Abdul is less excited about the proposal. He think that democracy requires more voices to be heard. Reducing the number of councillors might speed things up but it will also reduce the number of people who have a real say in city government. Abdul has lived in Markham since 1999. During that time, he says, there has been an incredibly low number of new facilities built for the quickly growing community. Community centres and other public facilities are just taking way too long to be built. He has put growth at the center of his campaign. 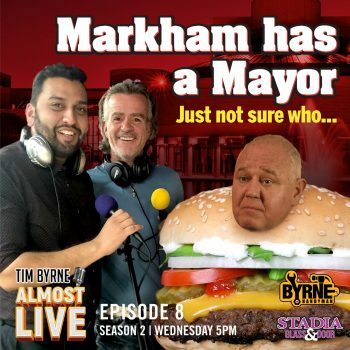 S02E07 – Who’s your mayor?